Since its inception in March 1957, the S&P 500 price index has realized a negative return in 17 calendar years. Including 2018. This means that the index records a negative return in roughly one in every four calendar years. On average the index fell almost 13%, with a median negative return of 11%. 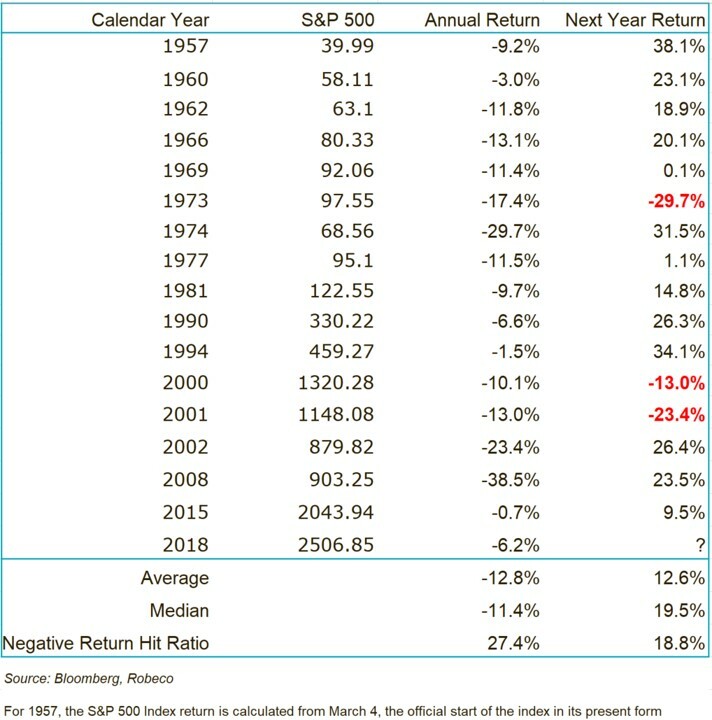 Perhaps more interesting is what happened in the years after the S&P 500 realized a negative return. On the 16 occasions prior to 2018, the index recorded another negative return in the subsequent year, or almost 19% of the time. Stocks went up an average of 12.6% in the year following a negative return, with a median of almost 20%. So history suggests that the odds of a positive year for the S&P 500 in 2019 are relatively high, but the odds of another negative year certainly aren’t negligible. ← 2018 in (tweeted) charts!